Dove's Go Fresh Cucumber Deodorant Stick is an antiperspirant deodorant which provides effective protection against sweat and odour. The deodorant is bursting with the refresh and calming scents of cucumber and green tea, leaving you smelling great throughout the day. 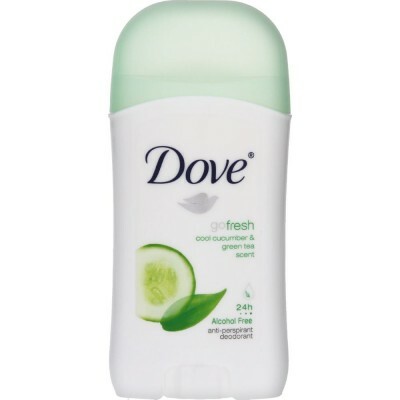 The deodorant provides up to 48 hours of antiperspirant protection, so you can feel fresh and confident all day. Dove's formula contains 1/4 moisturising cream and no alcohol, which means that your delicate underarm skin will be protected from the irritation caused by shaving and your skin will be left soft and smooth. The 40ml is size is perfect for traveling, so you can feel fresh on the go.